PROCEEDINGS OF THE NIGERIAN SENATE OF TUESDAY, 19TH DECEMBER, 2017. Welcome to a new Legislative Day in the Senate of the Federal Republic of Nigeria. Senate President, Dr. Abubakar Bukola Saraki took the official Prayer and led the Chambers into today’s proceedings at 10.59am. 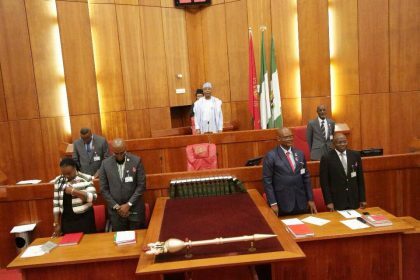 The Senate moved into an Executive Session at 11.01am and resumed from its Executive Session at 11:44am. Senate President, Dr. Abubakar Bukola Saraki, reported that at the executive session, the Senate deliberated on the 2018 Budget. Senator Rabiu Kwankwaso moved for the approval of votes and proceedings of Tuesday 5th December, 2017. Senator Duro Faseyi seconded. Senate President, Dr. Abubakar Bukola Saraki, read a letter from President Muhammadu Buhari on the appointment of Hon. Kadi Ibrahim Imam as acting Grand Kadi of the Sharia Court of appeal of the Federal Capital Territory. Senate President, Dr. Abubakar Bukola Saraki, announced that Senators Dino Melaye, Monsurat Sunmonu, Joshua Lidani, Gershom Bassey, David Umaru as members of the Senate Committee of the Nigerian Financial Intelligence Agency (NFIA) and Senator Chukwuka Utazi as the Chairman of he Committee. Deputy Senate President, Ike Ekweremadu, came under relevant orders to wish the Senate President and Chairman of the 8th National Assembly, Dr. Abubakar Bukola Saraki a Happy Birthday and appreciated him for all his contributions in the Senate. Senate President, Bukola Saraki thanked his Distinguished colleagues for all the wishes. Senator Bala Na’allah cited orders 42 and 45 and sought the leave of the Senate to move a motion on his concerns for the ongoing budget process. “It is important to have the appropriation Bill go for 3rd reading, the executive arm of Government is not ready for the budget to be passed” -Senator Barnabas Gemade. “We are lawmakers not lawbreakers. We must have to read the Medium Term Expenditure Framework (MTEF) 4 months before looking at the budget and a minimum of 50% of the budget should be passed before the year runs out. There is no correlation between the 2017 budget and the coming 2018 budget”-Senator Mao Ohuabunwa. “There is no good coordination between the executive and the legislative. 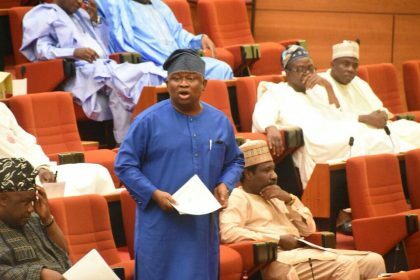 The MDAs are not ready for the budget defence, most MDA heads are out of the Country”-Senator Lanre Tejuoso. “We need to know the projects that are ongoing and new projects so we can know the correlation”-Senator Mohammed Hassan. “It was clear the 2017 budget would be rolled over, there is no relationship between the 2017 and 2018 budget. We need to strengthen the capacity of our treasury, no kobo was paid by the Nigerian National Petroleum Corporation (NNPC) in 2016 and 2017 which is leaving our revenue hanging”- Senator Dino Melaye. “Truly it is very disappointing and disheartening to hear the various experiences of the committees, how can anybody in the executive be so irresponsible to pick this period of time to be travelling, they’ve had all time to travel”-Senate President, Dr. Abubakar Bukola Saraki. Senator Atai Aidoko cited order 43 and spoke on his worry about the media both online and mainstream declaring his senatorial seat vacant. Senator Mohammed Hassan cited order 42 and spoke about Nigerian Custom warehouse being stocked with perishable goods whereas people are dying of hunger. He sought the leave of the Senate to bring it as a motion on another legislative day. 1 Federal Institute of Industrial Research Bill, 2017 (SB. 585) by Senate Leader. The Federal Institute of Industrial Research Bill, 2017 (SB. 585) was read the FIRST time. 2 Vigilante Group of Nigeria (Est, etc) Bill, 2017 (HB. 718) by Senate Leader. The Vigilante Group of Nigeria (Est, etc) Bill, 2017 (HB. 718) was read the FIRST time. 3 Subsidiary Legislation (Legislative Scrutiny) Bill, 2017 (HB. 13) by Senate Leader. The Subsidiary Legislation (Legislative Scrutiny) Bill, 2017 (HB. 13) was read the FIRST time. 4 Courts and Tribunals Fines and Financial Penalties Bill, 2017 (HB. 642) by Senate Leader. The Courts and Tribunals Fines and Financial Penalties Bill, 2017 (HB. 642) was read the FIRST time. 5 Radiographers (Registration, etc) Act (Amendment) Bill, 2017 (HB. 676) by Senate Leader. The Radiographers (Registration, etc) Act (Amendment) Bill, 2017 (HB. 676) was read the FIRST time. 6 Medical Residency Training Bill, 2017 (HB. 982) by Senate Leader. The Medical Residency Training Bill, 2017 (HB. 982) was read the FIRST time. 1 Report of the Committee on Capital Market on the Demutualization Bill, 2017 (SB. 531) by Senator Mustapha Bukar. Senator Peter Nwaoboshi seconded that the Senate do receive the report of the Committee on Capital Market on the Demutualization Bill, 2017 (SB. 531). The report of the Committee on Capital Market on the Demutualization Bill, 2017 (SB. 531) was LAID. 2 Report of the Committee on Capital Market on the need to determine the status of unclaimed N90b Dividends in Securities for Nigerian Investors by Senator Mustapha Bukar. Senator Peter Nwaoboshi seconded that the Senate do receive the report of the Committee on Capital Market on the need to determine the status of unclaimed N90b Dividends in Securities for Nigerian Investors. The report of the Committee on Capital Market on the need to determine the status of unclaimed N90b Dividends in Securities for Nigerian Investors was LAID. 1 Report of the Committee on Tertiary Institutions and TETFUND on the Nigeria Arabic Language Village, Ngala (Establishment, etc) Bill, 2017 (SB. 386) by Senator Jibrin Barau. Senator Fatimat Raji- Rasaki seconded that the Senate do consider the report of the Committee on Tertiary Institutions and TETFUND on the Nigeria Arabic Language Village, Ngala (Establishment, etc) Bill, 2017 (SB. 386). Senate dissolved into the Committee of the Whole for the clause by clause consideration of the Nigeria Arabic Language Village, Ngala (Establishment, etc) Bill, 2017 (SB. 386). The Nigeria Arabic Language Village, Ngala (Establishment, etc) Bill, 2017 (SB. 386) was read the THIRD time and PASSED. 2 Report of the Committee on Tertiary Institutions and TETFUND on the Nigeria French Language Village, Badagry (Establishment, etc) Bill, 2017 (SB. 387) by Senator Jibrin Barau. Senator Mohammed Hassan seconded that the Senate do consider the report of the Committee on Tertiary Institutions and TETFUND on the Nigeria French Language Village, Badagry (Establishment, etc) Bill, 2017 (SB. 387). Senator Jibrin Barau presented the report of the the Nigeria French Language Village, Badagry (Establishment, etc) Bill, 2017 (SB. 387). 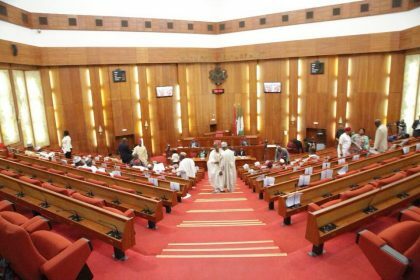 Senate dissolved into the Committee of the Whole for the clause by clause consideration of the Nigeria French Language Village, Badagry (Establishment, etc) Bill, 2017 (SB. 387). The Nigeria French Language Village, Badagry (Establishment, etc) Bill, 2017 (SB. 387) was read the THIRD time and PASSED. 3 Report of the Committee on Banking, Insurance and other Financial Institutions on the Dishonoured Cheques (offences) Act CAP D11 LFN 2004 (Amendment) Bill, 2017 (HB. 288) by Senator Rafiu Adebayo. 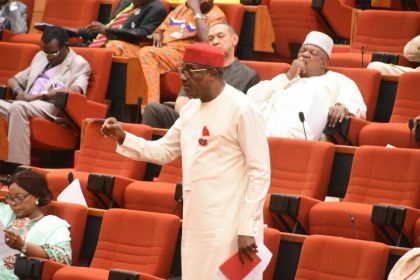 Senator Sam Anyanwu seconded that the Senate do consider the report of the Committee on Banking, Insurance and other Financial Institutions on the Dishonoured Cheques (offences) Act CAP D11 LFN 2004 (Amendment) Bill, 2017 (HB. 288). Senator Rafiu Adebayo presented the report on the Dishonoured Cheques (offences) Act CAP D11 LFN 2004 (Amendment) Bill, 2017 (HB. 288). Senate dissolved into the Committee of the Whole for the clause by clause consideration of the Dishonoured Cheques (offences) Act CAP D11 LFN 2004 (Amendment) Bill, 2017 (HB. 288). The Dishonoured Cheques (offences) Act CAP D11 LFN 2004 (Amendment) Bill, 2017 (HB. 288) was read the THIRD time and PASSED. Plenary is adjourned to Wednesday, 20th December, 2017.